If your house is like mine was when the kids were little, cookies seem to vanish into thin air. If this is a problem at your house, why not get a superhero cookie jar to protect your sweets? These collectible cookie jars bring a touch of useful whimsy into the kitchen, and are sure to be kid pleasing--especially if they are full of delicious treats. These jars are not air-tight, so you will need to have sweets that are not too soft to start with. Too soft cookies will droop and mold themselves to each other inside the jar. To preserve the paint on your cookie jar, hand washing is recommended. My kids are grown and have kids of their own to snitch my cookies. Come to think on it, these days, my husband snitches cookies! 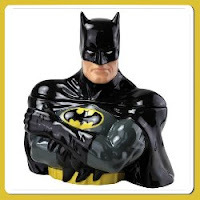 I guess I need a Batman cookie jar to guard my cookies. Sometimes, you can find superhero cookie jars at yard sales. If you do manage to locate one at a yard sale, be sure to inspect it for chips and paint flaking off. The easiest way to find chips is to run your fingers lightly over all edges. Your fingers will detect tiny imperfections that your eyes won't see, but don't press too hard or you may be cut. Who Do You Want To Be? My son loved the Superman movies starring Christopher Reeves when he was little. From the time he first saw the first movie until he was about seven years old, if you asked him what he wanted to be when he grew up, the answer was always "Superman!" Superman is the epitome of truth, justice, and fairness. Not such a bad thing for children to aspire to. These days, my grown son shares his interest in Superman and other superheroes with his own son. They would both enjoy this Superman cookie jar , especially if it was full of their favorite cookies! This molasses cookie is one of my favorites and is a great choice to fill your cookie jar! The authors, Linda and Susan, of this blog are Amazon Affiliates. Linda is an affiliate of several programs through ShareASale. Purchases made through the links in these articles may provide either Linda or Susan with a small commission at no extra charge to you (Thank You!). What Does Normalization of a Database Mean? Copyright on all articles belongs to the respective author. Simple theme. Powered by Blogger.